After a very odd chain of events with the weather model simulations, it appears as though the chances for a formidable snowstorm are increasing for the DC area (especially eastern portions of the area). The current issue is that there are still one or two models that suggest an out-to-sea track, therefore preventing more significant snowfall. However, a vast majority of the other computer models suggest a track that could produce significant amounts of snowfall. Currently, The Capital Region Pulse weather team is going with a 4-8 inch forecast for the DC Metro area with less to the west and more to the east. However, these amounts could be shifted in either direction as the event draws closer. Please stay tuned for a full update. 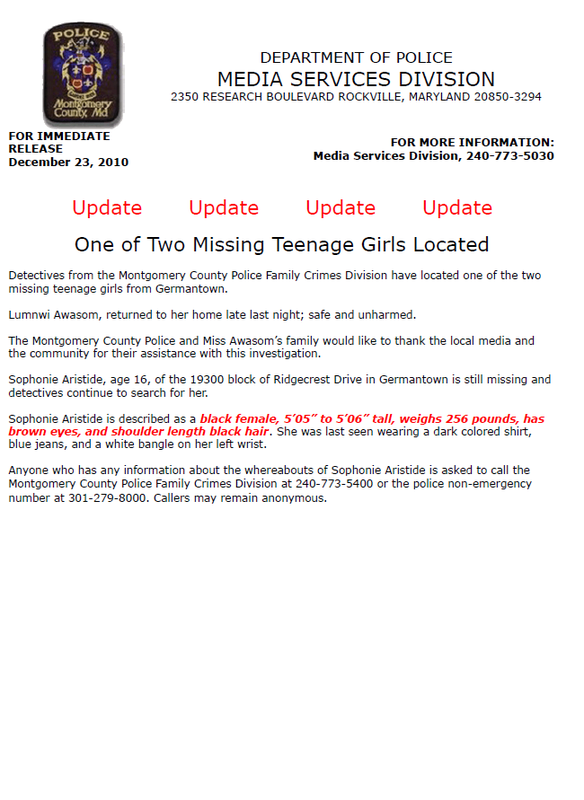 Germantown, MD (Capital Region Pulse) - Two teenage girls went missing from Germantown, MD late last night. Montgomery County Police are reporting that one of the girls has returned home safely, but one remains missing. The Family Crimes Division has been working closely with the families on this investigation. Please see the unabridged press release below. Again, we want our readers to see the raw information we receive. If you have any information, please contact the police using the methods listed in the press release. The threat for snow this weekend appears to be growing for the most part. The bottom line is that many of today's model runs brought the area of low pressure closer to the coast (this means a higher chance of snow). However, considering that the event is still quite a few days out, and there is still model divergence, the prudent call is still a conservative one. The image displayed to the left is from today's 12z ECMWF (European Weather Model). Notice the large storm system off the east coast of the United States (the tightly packed lines). This type of signature is an extremely powerful one for east coast storms. Taken exactly as shown, this would produce heavy snowfall for the I-95 corridor and surrounding areas (a lot of precipitation would fall to the southeast of I-95 in our area). The European model is still only one model, however. The key differences today over yesterday are that some of the other computer models have shifted slightly closer to this solution. There are presently a few solutions that could be the end result, and we will go over them in a minute. It is possible that the end result will be a compromise between the two different types of solutions currently being printed out by the computer models. Regardless, it is probable that there will be some snow in southeastern parts of the area...the question lies more with how far NW this precipitation reaches. Compare the image at the right to the image posted above and you will notice that the area of low pressure that could produce snow is farther off the coast (meaning less snow for inland areas). It is important, however, to note that the image (GFS model) has shifted closer to the ECMWF model portrayed above. If this trend continues, it could signify the threat for snow is increasing. I do not want to throw out possible accumulation amounts at this time but the time may be drawing close for some early guesses. 1) The storm system forms but quickly skirt off the coast and leaves only southeastern-most portions of the area with a little light snow. This solution might even leave our skies mostly sunny. 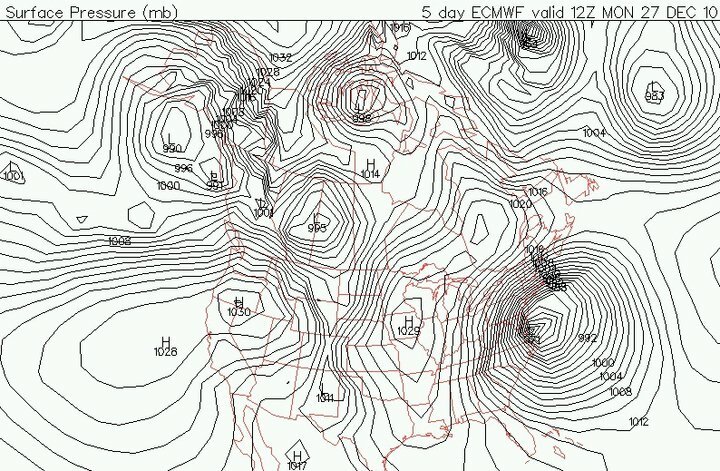 2) The storm system climbs/crawls up the coast as the more extreme (and consistent) ECMWF model show. This would produce heavy snowfall and gusty winds across a large area (including the I-95 corridor). There is also a chance a middle ground solution could be reached where light snow would impact the area with the heaviest to the southeast. There is still a lot of time for things to be worked out. 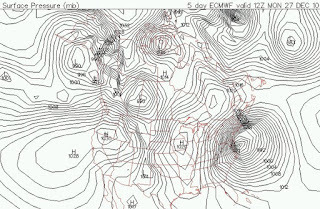 REGARDLESS - This is NO LONGER a Christmas storm system. STAY TUNED to The Capital Region Pulse for continuing updates. We will be posting another update tomorrow around this time. 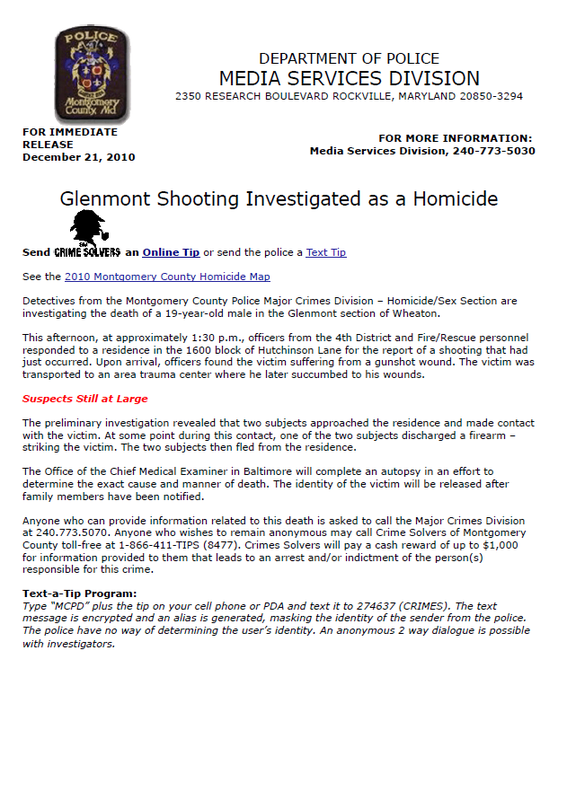 Glenmont, MD (Capital Region Pulse) - At approximately 1:30pm yesterday (December 21), a 19-year-old male was fatally shot at a house in Glenmont, MD. Montgomery County Police detectives are currently investigating this incident as a homicide. According to police, the incident occurred in the 1600 block of Hutchinson Lane - this is near the intersection of Randolph Road and Kemp Mill Road. The victim has not yet been identified as notification of next of kin is yet to occur. Just after the incident, a nearby school as briefly put into "code blue" status but instruction continued uninterrupted. Police are asking anybody with tips to contact them (see press release below)*. *We want our readers to have access to the raw materials as well. Below, you will find an unabridged media release from the Montgomery County Police Media Section. The last couple of days have featured many media outlets discussing the potential for Christmas snowfall. However, only a small percentage of the general public understands the mechanics behind this threat. To start things off, let us discuss why the media outlets are jumping on this threat so far in advance. A White Christmas is an event that many people fantasize about, but seldom see. Other than holiday shopping stories, this week is slow for news producers. The producers of local and national news pressure the on-air meteorologists to stick their necks out more than they would normally be comfortable with. The weather models (computer simulations of weather forecasts) are in somewhat decent agreement that there will be snow (thus increasing overall confidence in an event happening). With those thoughts in mind, I would like the readers of this website to keep their minds open to both sides of the argument (snow vs no snow). To keep things in relatively simple layman's terms - several "pieces of a puzzle" must come together in the correct combinations for a big storm to occur. Pieces of energy known as "shortwaves" must phase, tilt, and combine at the right times or no snow will occur (or a much smaller scale storm). The latest run of the GFS, for example shows the storm almost making the turn up the coast, but then being whisked out to sea (see image below). This image shows the low pressure center fairly weak, and about to roll mainly east or northeast off the coast. In comparison, many other computer models are suggesting the storm will intensify sooner and take a more northeasterly or NNE track closer to the coast - such a result would allow for more snow on the I-95 corridor of the east coast. As should be obvious by now, many factors are involved in this and a white Christmas (or near Christmas) is certainly on the table, but by no means certain. Stay tuned for continuing updates as the event draws closer. For now, The Capital Region Pulse weather team will say that there is a 40 percent chance of at least 1 inch of snow on Christmas Day. But that can go up or down! 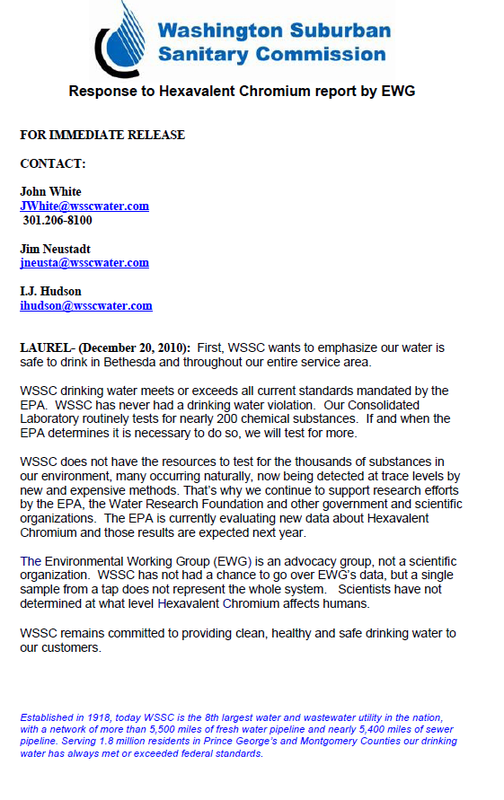 The Capital Region Pulse has just received a media release from the Washington Suburban and Sanitary Commission (WSSC) about the article we last posted about. We wanted our readers to be able to view the media release unabridged. A study to be released today by the Environmental Working Group exposes the presence of a probably carcinogen in parts of the regions water supply. The agent (hexavalent chromium) was allegedly found in the tap water of Washington and Bethesda. The substance was declared a probable carcinogen in 2008, and the Environmental Protection Agency (EPA) is currently assessing the need for limits to be set. Presently, utilities are required to test for this substance in the water, but this also includes another type of substance that humans need to process glucose in the body. A source also stated that bottled water is not necessarily safer. Many studies on bottled water in the past have shown that a large percentage of bottled water comes from municipal sources. The study revealed the chemical in 31 of the 35 cities that were sampled. Stay tuned for upcoming updates on this developing story. Welcome to The Capital Region Pulse! Whether you came from our Twitter page, Facebook page or elsewhere...we would like everyone to feel right at home with one of the newest news providers in the Washington Metro area! The CRP will provide breaking news updates, local event information, weather updates, traffic updates, and more! Please take the time to find us on the following websites and show your support by "Following" or "Liking" accordingly! All of your support is greatly appreciated. We take support as a sign that we are doing the right thing!